The British Canoeing Sea Kayak Award (formerly known as the 3 Star award) is new for 2019. It is an ideal course to develop coastal sea kayaking skills in light to moderate winds and tidal waters. The course will include training and assessment for the British Canoeing Sea Kayak Award. This course is ideal for paddlers wishing to gain further experience of coastal sea kayaking skills. If you have a few days of sea kayak experience, are confident in coastal waters and light winds, and with a desire to develop your skills in wind, waves and tidal waters, this sea kayak development week will meet all your aims. There’s no need to be able to roll to attend this course. We will include coaching in balancing, bracing and rolling skills during the week. Can I be assessed for the British Canoeing Sea Kayak award? we will include an assessment for this award during the 5-day course. 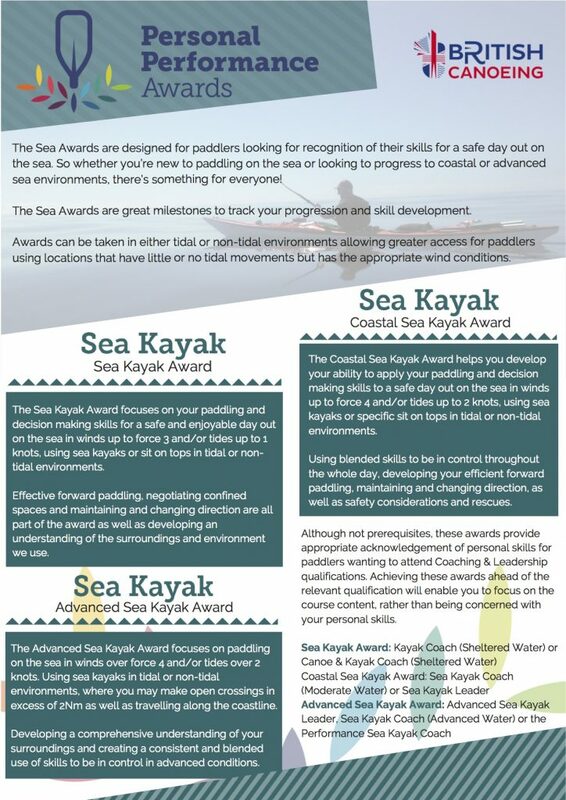 We will always provide full coaching in all aspects of the Sea Kayak Award for all clients, and will give a clear action plan for developing any outstanding skills, in readiness for a future successful assessment.